Fred Beans Subaru is a Subaru dealership that sells the exhilarating Outback, Forester, Legacy, Impreza, WRX, BRZ & Crosstrek models to our friends and customers in the Allentown, Sellersville, Feasterville and Jenkintown area. Our large, expanding inventory and dedicated sales team makes us a great choice for buying a new Outback, Forester, Legacy, Impreza, WRX, BRZ or Crosstrek in Doylestown. At Fred Beans Subaru, we have the experience to get you into the driver's seat of that new Subaru vehicle that will meet all of your needs. To test drive a new car, truck or SUV including the new 2019 Subaru Ascent, give us a call at (877) 865-6607 or simply visit us at 830 N. Easton Road, Doylestown, Pennsylvania and take one of our new or used cars for a drive today! Get Your ePrice For Instant Internet Savings! Not only do we keep a vast selection of new Subaru vehicles but we also have an extensive used car selection that will be sure to satisfy your car shopping needs. 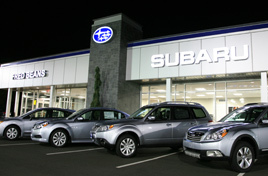 At Fred Beans Subaru, we make sure our used and pre-owned vehicles are top of the line in quality, service and price. If you already know of a used vehicle that meets your needs, we recommend using our CarFinder tool and we will be sure to locate that specific vehicle for you. Do you already own a new 2018 or 2019 Subaru? If you are a proud owner of a new Subaru and are looking for OEM certified parts and accessories, we've got you covered. Our Doylestown Subaru auto parts store has everything from performance parts and accessories to floor mats, mud flaps, and windshield wipers. You can place your order online, by phone, or stop by and see us in person! For professional installation, contact an associate in our Doylestown Subaru repair shop. From everybody at Fred Beans, we look forward to serving you in the near future!